Roni Zeiger: what is a patient? This vision he developed based on his professional experience and as experienced patient. 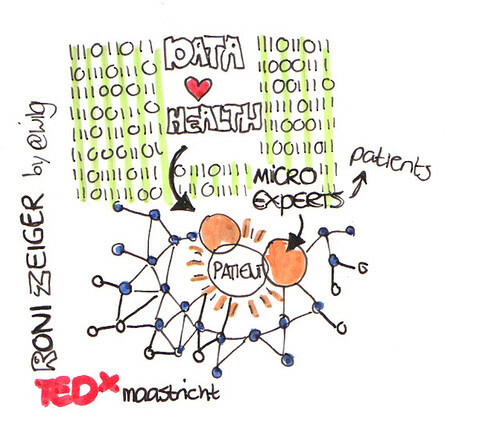 Zeiger takes the TEDx Maastricht audience on his journey to the discovery of the expert patient. Genetic code, he originally thought during university, brings us the solution to big medical problems like cancer. Later on, he learned that biology and pathology matter only in the context of people’s stories. During his medical study he discovered ‘I am a geek’. He saw how little doctors use data and decided to do something about that. So he ended up at Google, where Google Flu Trends is one of his favorite projects. Based on search words Google creates a trendline for flu that is almost identical to the trendline from the US Centers for Disease Control. With a little data there is so much to create from. ‘This is the power turning tiny stories that people put into the search box, into data.’ En passant Zeiger announces a new search function of Google: Google symptom saerch. Google analyses diverse search results realtime to see which health conditions best match the symptom query. Zeiger continues to tell about his travels. He meets Gilles Frydman who builds online communities for patients. He reads great stories. But mainly he learns that a smart patient, being confronted with a life-threatening disease can quickly become an expert in his disease. Important for physicians is, concludes Zeiger, is that doctors should listen to their patients. Don’t only look at symptoms. Embrace the patient story. Expert patients are everywhere and they are impatient. They are experts and they want to collaborate. How do you put your inspiration into action?